The power industry is only as good as the historical data it keeps on all the components that make up a power facility. Without historical data, original equipment manufacturers and construction companies lose their ability to improve boiler design and labor productivity. More importantly, they lose the ability to establish accurate costs, budgets, and bids; and risk lowering their companies’ profitability. With the increase in today’s new boiler construction, now is the time for those in the construction industry to increase their level of understanding of the components, the labor crafts, and the historical data that pull it all together. Good, up-to-date, historical data is needed on vital boiler components like brick, refractory, insulation, and lagging (bril) to keep these boilers thermally and energy efficient. A modern day boiler is a box formed by membrane welded water wall tubes that uses the fire inside the furnace box area to heat the water inside the water wall tubes into steam. Covering these water wall tubes and sealing gaps and openings are the brick, refractory, insulation, and lagging materials (hereafter referred to as bril). These bril materials are all key components for every type of steam-generating boiler and are used for personnel protection, heat conservation, and to help maintain boiler efficiency. Steam, steam-generating boilers, and bril materials have been around since 200 BC, when the Greek designer Hero designed his Aelopile, which used steam as its power source. The steam-generating industry can debate how and when the industry actually started—whether it began with the water tube boiler designed by Mr. Wilcox in 1856 or with Mr. Blakey’s boiler design in 1766. Both can be said to have led to the development of the brick-faced boiler design, which was the forerunner of boiler designs today. The brick-faced boiler had no water wall tubes but used brick walls (18 to 22 inches thick) to form the fire box, which encased tubes located inside these brick walls. The brick walls formed the fire box area and acted as a barrier to keep the fire inside the furnace box and prevent heat loss. Later boiler designs included the tube and tile boiler (boilers with wide-spaced water wall tubes enclosed with flat tile or brick and insulation), the flat studded boiler (closer spaced water wall tubes covered with refractory and insulation), the tangent tube boiler (water wall tubes on very close tube spacing covered with refractory and insulation), and finally the membrane tube boiler (smaller water wall tubes welded together and covered with insulation and lagging). Regardless of when the industry started, however, bril materials were required from the beginning, and so was the need to keep historical data. As recently as 15 years ago, most boiler companies (power plants, engineering and manufacturing, and construction type) had a department, group, or resident expert bril person to support and monitor bril material requirements. These designated experts recorded and kept bril historical information, from the proposal stage to final contract completion. They understood that bril historical data begins with the calculation and compilation of quantitative bril material takeoffs that can then be used to generate labor and material cost estimates. Most companies’ policies were to have these takeoffs compiled along with the cost estimates regardless of whether the bril work was to be done using in-house labor craft or an outside contractor. The same takeoffs and cost estimates were used to help monitor material procurement, labor man-hours, labor productivity, labor inefficiencies (see Figure 1), and boiler design changes or flaws. Obviously, these companies knew the importance of bril materials and their impact on boiler designs, company profitability, and project scheduling. Unfortunately, today’s boiler companies reflect today’s business trends. The trend now is for these companies to outsource bril material requirements, continue to cut back on human resources and expertise, and ignore the value of keeping historical data. The discontinued practice of keeping historical bril data also includes the calculation of quantitative takeoffs and establishing labor and material cost estimates, which are now all outsourced. What Is the Danger in Not Keeping Historical Data? Keeping historical data helps improve boiler design; correct design flaws; document labor variances by region or country; improve labor productivity; and establish better costs, budgets, and bids by building con-bed estimating data for use on future boiler projects. The term “con-bed” means “construction base estimating data.” It is an estimating data system (sometimes called voodoo estimating) that uses historical data from actual contract material takeoff quantities, material costs, and labor man-hours as a tool for bidding new projects of similarly designed steam-generating boilers or air-pollution systems. Most steam-generating boilers and air-pollution equipment—regardless of manufacturer—are designed to be similar to a previously designed and sold system. The difference may be the physical dimensions and boiler capacity (megawatts). This duplication of design helps reduce engineering costs and improve shop fabrication costs. The bril designs for each different boiler type will use the same material type and thickness, and will only vary in quantity required for that particular boiler’s size and capacity requirements. Develop actual contract quantitative material takeoffs of the boiler proper (including boiler and furnace walls, penthouse walls and roof, wind box casing, vestibule casing, steam lines, soot blower piping, and boiler trim and drain piping). Calculate material and labor cost estimates, labor man-hours, and expected productivity using the quantitative takeoffs developed in Step 1. Establish a standard envelope or “E” number value that will be directly related to the physical dimensions of the boiler proper (see Step 1). For example, E = 2 x (width of boiler + depth of boiler) x (height of furnace). Divide the cost estimates and labor man-hours established in Step 2 by the fixed-number values established in Step 3. This will establish the con-bed base estimating cost and man-hour values for each bril component. Divide the material quantitative takeoff amounts (lineal footage, square feet, etc.) as established in Step 1 by the fixed-number values that were established in Step 3. This will establish the con-bed base quantitative takeoff values for each bril component. Calculation of material and labor costs on future projects of similar or duplicate boiler types by calculating a new envelope or E value and multiplying that value by the con-bed estimating data established in Step 4. These estimates can be used for proposal bidding and as a purchasing tool for comparing outside pricing with internal cost estimates. Calculation of material quantitative takeoff on future projects of similar or duplicate boiler types by calculating a new envelope or E value and multiplying the values by the con-bed takeoff established in Step 5. These quantities then can be used for soliciting outside pricing and estimating export shipping costs. They also can be used as a scope definition in proposals. Unfortunately, once a company stops keeping historical data, the end user ultimately suffers. Stiffener designs. Many boiler manufacturers design (and supply) their flues, ducts, and air-pollution equipment systems without taking into consideration the cost or impact their stiffener designs will have on the insulation and lagging that will be required later in the project. Historical data would have supported and confirmed that using large stiffeners greater than 7 inches high is detrimental to the longevity and integrity of the insulation and lagging systems being designed and installed today. This is why it is forecasted that the power industry will spend more than $40 million in the next 5 years reworking the insulation and lagging installed on these new systems. Duct or flue? The terms “duct” and “flue” are exact opposites but are sometimes used interchangeably in the power industry. The term duct applies to a system that carries air, and the term flue applies to a system that carries gas. One way to differentiate between the two is to remember “flue gas” and “air duct.” There is obviously an important difference between the two, and the interchange of the two terms could result in a serious misunderstanding between the customer, project management, plant personnel, engineering, and labor craft. Historical data helps preserve the continuity of nomenclature and addresses the need for understanding the difference between the boiler’s components. Labor adjustments and work schedules. The computation of labor and the differences in work schedules are common points of misunderstanding. Labor adjustments occur when the schedule of work affects the productivity of the labor force and the amount of time required to perform the required work. 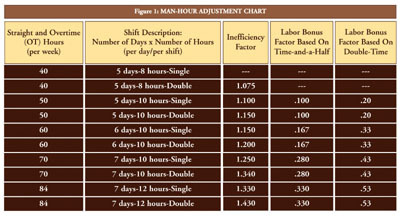 The calibration of labor costs is based on the adjustments of labor due to the number of hours worked and the number of days worked during a given week. The schedule of work dictates what adjustments must be made to the man-hours and the labor cost. See Figure 1 for some common work schedules. Based on Figure 1, the length of the work schedule, the number of hours worked, and the number of shifts required will all seriously affect the total cost of a project and could affect the total construction work schedule. Historical data can be used to support the inefficiency and bonus factors listed above and/or show when those factors should or should not be used. For example, keeping historical data would show that labor inefficiency for installing bril materials does not take place until the duration of the work schedule extends longer than 7 consecutive workdays. Additional pins often are required when standard size board, blanket, or block has to be cut at corners, wall openings, and other areas where a full insulation piece cannot be used. In most cases, the pins installed in the shop are not sufficient and require additional pins installed in the field. This becomes a back charge to the installation. Installing insulation pins in the shop limits the use of different types of insulating applications. When installing the insulation pins, shop labor most often does not take into account the lagging attachments that are also required. This can have a serious impact on the integrity of the insulation system. Lagging may be the last thing you install, but it must be the first thing you think about when designing insulation and lagging systems. The power industry is going through a growth period not seen since the late 1970s and early 1980s. Power companies will be spending billions of dollars on new power plants over the next 5 years. As an industry, it is important to educate at all levels—from the plant level to the equipment manufacturers, installers, and suppliers—on the importance of keeping good historical data and properly training workers at steam-generating plants. Knowledge is everything: Historical data is the key for a successful, healthy, and vibrant power industry.